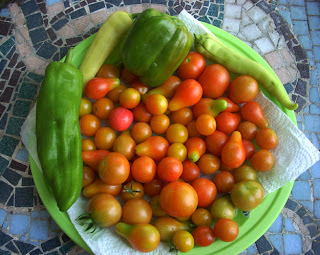 The first tomatoes and peppers of the season have ripened today. Tomato varieties include: Big Cherry, Sweet 100 Cherry, Pear and Grape Tomatoes, Porters and Sun Gold. I prefer to plant smaller tomato varieties that mature quickly to beat the Texas heat. I have continued to have the most success with these varieties in North Texas. My tip is not to buy tomato varieties that are shipped in from the chain stores that might grow better in say Michigan. Buy your tomato plants from a locally owned nursery. They know what varieties grow best here in Texas. Pepper varieties from left to right include: Giant Sweet Marconi, Sweet Banana and California Wonder Bell Pepper. Peppers grow well in Texas. I always get large, continuous pepper crops in the spring, early summer and fall. During the heat wave of July and August, production slows down. During this time keep watering the plants to keep them alive and you will be rewarded with a huge crop of peppers when the weather begins to turn cooler in the fall.